Two major European airlines recently posted startling profit numbers and bleak forecasts, a clear signal that international service is struggling. 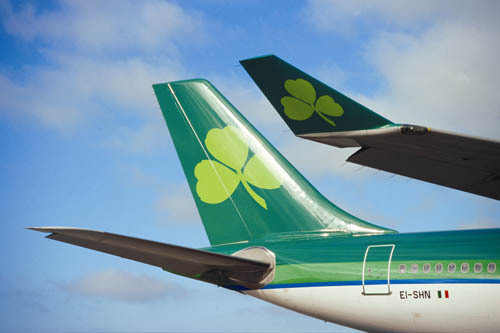 [[Aer Lingus]] posted a full-year loss of $136 million, after reporting a $105 million profit in 2007, and [[Lufthansa]] saw its 2008 profit drop by 64 percent (though it did manage to make money). What’s more alarming, though by no means surprising, is the outlook each airline has for the coming year. Aer Lingus’ CFO said he doesn’t expect the airline to make money in 2009, and singled out the transatlantic market as “the weakest part of our business.” He suggested transatlantic fares may be reduced and routes could be cut, but no decisions have been made yet. According to Forbes, Lufthansa doesn’t have an accurate forecast for 2009, but admits profits will continue to drop. It’s becoming increasingly clear that international travel, generally seen as a reliable revenue generator for airlines, is rapidly weakening. While both Aer Lingus and Lufthansa have significant business within Europe, the transatlantic markets are crucial for both—and for customers. Each airline is a primary carrier not only to their respective home countries (Ireland and Germany), but to the Continent overall. A reduction in transatlantic service by either of these, coupled with contraction from domestic carriers, could mean fewer options for American travelers heading to Europe. Of course, not many American travelers are heading to Europe these days, which is the fundamental obstacle facing these two airlines.